Yael Rozenstain was born in 1888 in Norinck, Ukraine. There, he attended cheder and grammar school. In 1896, Yael Rozenstain moved to Odessa, where his father had a job in the fishing industry. In Odessa, Yael was able to further his education at the Faiger Gymnasium. Through meeting Lev Bronstein (Leon Trotsky), he became politically active and his mother feared that his radical beliefs would cause difficulties for the family. She encouraged him to emigrate from Russia. In 1900, Yael Rozenstain stowed away on the English ship, Sandone. When he made his presence known, the Captain allowed him to work with the cook, eventually serving the Captain’s table. Rozenstain changed his goals while working on the ship and traveling to such diverse places as Belgium, Japan, India and Australia. He wanted to become rich! In South Australia, he began working as a peddler. He continued this work in New Zealand. In 1906, at the age of 18, Yael Rozenstain journeyed to America, stopping first in Seattle, Washington before continuing on to Fairbanks, where there was a gold rush. Rozenstain worked in the mercantile industry, catering to miners. First, he worked for Simpson Brothers. He then took a job as a clerk at Barney Simon’s clothing store. He saved his money and eventually opened his own tent store on Olive Creek. 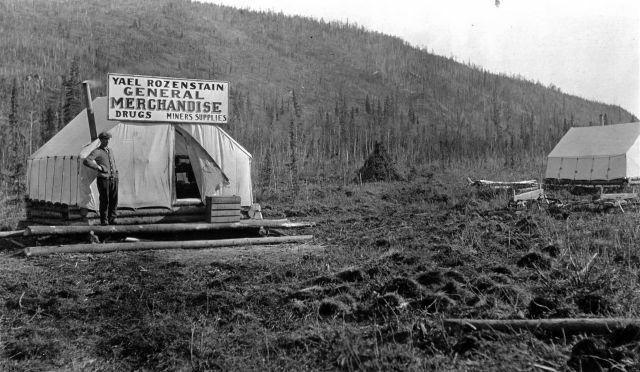 Rozenstain followed the miners and opened another store in Livengood. In Hyder, Rozenstain built a 60 x 150 foot store. He lived upstairs. 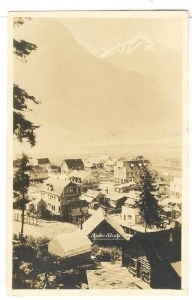 Hyder, Alaska, beneath the mountains, vintage postcard. Business was good until 1938. Then, Rozenstain moved on to the fishing villages of Dillingham in hopes of increasing his sales. In 1944, he sold this business to Libby, McLeill & Libby. Yael Rozenstain retired to San Diego, California — rich! Yael Rozenstain married Jenny Margolis, a nurse, in 1926 in Seattle, Washington. Together they had one daughter: Sherrah. Yael and Jenny lived separately because she did not like Alaska. He would visit her in San Diego during their marriage. Jenny Rozenstain died in 1947. In 1956, Yael Rozenstain married Elise Meyer in San Diego. The Rozenstains were members of Congregation Beth Tefilah in San Diego. In December, 1957, the Southwestern Press announced that Mr. and Mrs. Yael Rozenstain of La Mesa announced the engagement of their son, Horace Meyer Rosenstain, to Shari Schoenholz of San Leandro. The couple planned to reside in San Diego. Yael Rozenstain died in 1986. 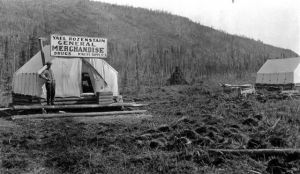 Yael Rozenstain, “Memoirs of an Alaskan Merchant,” Western States Jewish Historical Quarterly 9/3. Samantha Silver is curator of this Yael Rozenstain exhibit.